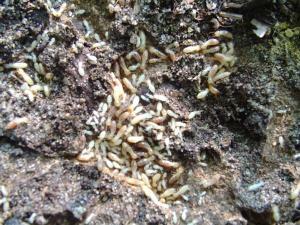 Termites are one of a homeowner's worst fears. They often go undetected as they eat their way through the wood frame of a house and by the time you start to see exterior signs of their presence, there may already be extensive damage behind the walls that is very costly to repair. 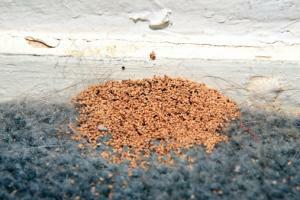 If you train yourself on what to look for, however, it's not hard to see the less obvious signs of termites. Other than crumbling wood, mud tunnels are of the most obvious signs of termite presence, especially the subterranean species of termites. 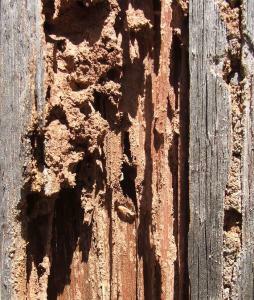 These termites live in the ground, but go to 'work' each day in the wood of your house. Yet they cannot be exposed to air and sunlight or their tiny little bodies will dry out, so they build mud tunnels between their nests and the wood they are chewing away at. The mud tunnels are typically the diameter of a pencil and are mostly likely to be found on the foundation of the home running from the ground to the bottom of the exterior siding which has the wooden structure of the home behind it. It's a good idea to get under the house so you can and check the inside wall of the foundation for mud tunnels, not just the outside wall. To be sure that what you see are active mud tunnels, scrape them away with a putty knife and check again a few days later to see if they have been reformed. Since some types of termites don't make mud tunnels, specifically drywood termites, you'll have to keep your eyes open for other signs as well. One of these signs is tiny balls of feces that the termites push out of the wood wherever they are working. Their feces are called 'frass' and may be visible around the exterior foundation of the home or inside the house on the floor or other surfaces. The frass looks like sawdust but if you look close, you'll see that it is formed in tight little balls (about the size of a pinhead) rather than appearing as shavings. 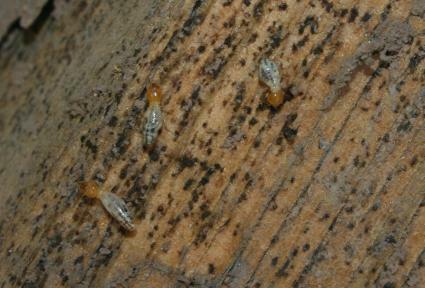 Termites spend most of their life hidden away underground and inside pieces of wood. However, usually once per year in the spring, and occasionally in the fall, a group will 'swarm' from the nest and take flight to make a new home somewhere else. It is a brief event that is easily missed, but if you do see it, it looks like swarm of flying ants. What you are more likely to see, however, is piles of their discarded wings that litter the ground and get caught in cobwebs around the house. The wings are translucent and shaped the wings of dragonflies, except they are tiny - less than a half inch in length. 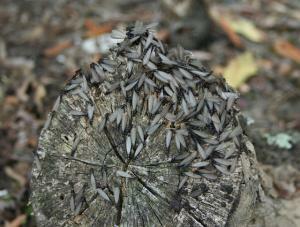 Naturally, seeing the insects themselves is the surest sign that you have termites. If you poke into a piece of wood where they are working or dig into a nest, you will see grub-like insect less than a half-inch long. They are usually semi-transparent to white in color, though some species may appear brown. Some species have a visible mandible (looks like a little pincher on the front of their head), while others have a small mouth that is not really noticeable. 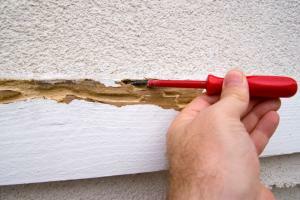 On the surface of a wood wall, termite damage can look a bit like moisture damage - the paint may crack or the veneer may bulge out. Termite damage also makes the wood crumbly when probed with a knife or screwdriver just like wood that is rotten from moisture damage or from dry rot. However, if you examine the wood more closely, termite damage has entirely different characteristics from other type of wood damage, even if the insects are not present to confirm that it is termites at work. Termites create smooth tunnels that run with the grain of the wood as they work, creating a honeycomb-like pattern, while rotten wood is just plain crumbly with no obvious pattern. As they progress they will eat all of the soft 'sap' wood, leaving the more durable heartwood in each board (if there is any), as well as the thin layers that correspond to the concentric growth rings in the wood. There are also types of beetles, ants and bees that burrow into wood, some of which that can also cause structural damage. However, none of these insects exhibit the tunneling pattern described above (tunnels running parallel to the grain of the wood). There is one final telltale sign of termite damage that sets it apart from other insects or rotten wood, which is the presence of dirt in the termite tunnels. The good news is that if you catch termite activity in the early stages, it can likely be treated with relatively inexpensive and non-invasive methods. All the more reason to check regularly for their signs or call a pest control professional to come look for you, a service that is often provided free of charge.